NIU’s Pick Museum of Anthropology will receive several awards on Thursday, Sept. 29, from the Illinois Association of Museums (IAM), a statewide professional organization recognizing best practices in the museum profession. The Pick Museum will receive awards for a recent exhibit, publication and graduate student of the year. The Pick Museum is the recipient of the 2016 Superior Award for its exhibition, “Storytelling: Hmong American Voices.” The exhibit, currently on display in the Museum, was developed by museum staff in conjunction with a 20-member Hmong Community Advisory Council. It tells the story of how life changed for Hmong refugees who resettled in the United States after the Vietnam War. Only one museum in the state receives the Superior Award, and this is the Pick Museum’s third year receiving the Illinois Association of Museums’ highest exhibit honor. To schedule a tour of this award-winning exhibit before it closes on Dec. 9, call 815-753-2011. The Pick Museum’s graduate assistant for the 2015-2016 academic year was named the IAM’s Museum Studies Graduate Student of the Year. “Steve Jankiewicz (NIU alum 2015, M.A. in Anthropology) is a natural leader and exceptional student. He was not only an invaluable curatorial assistant in his tenure at the Pick Museum, contributing significantly to the Storytelling exhibition, he actively participated in the Museum Student Board, collaborated on public programs and volunteered in support of special events such as the Museum’s 50th anniversary,” says Jennifer Kirker-Priest, director of the Pick Museum. 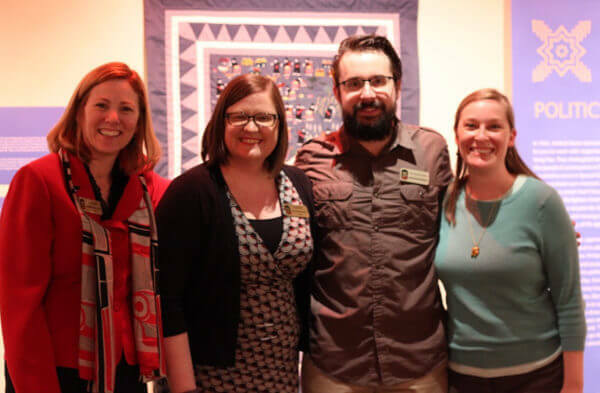 “We are so proud and happy that Steve has been recognized with this honor.” This is the fifth year that a student from NIU’s interdisciplinary graduate certificate in museum studies has received IAM’s Graduate Student of the Year Award. For the first time in its history, the Pick Museum has been honored with an Excellence Award in Publications. Created to celebrate both the 50th anniversary of the Pick Museum’s founding and the museum’s formal renaming honoring endowment donors James B. and Rosalyn L. Pick, the 50th Anniversary Collections’ Catalog offers readers a look at some of the most interesting objects in the museum’s 22,000-piece collection. Organized by geographic region, the catalog highlights collections from Southeast Asia, Native North America, Latin America, Papua New Guinea and Africa. Founded in 1964 by the Department of Anthropology in the College of Liberal Arts and Sciences, the Anthropology Museum houses a permanent collection of more than 22,000 ethnographic and archaeological objects. Collections emphasize Southeast Asia but include textiles, baskets and ceramics from throughout the world. With a dynamic schedule of exhibitions and programs in Cole Hall, the Anthropology Museum is a cultural destination for residents and visitors to DeKalb. The Museum is open Tuesdays through Fridays from 10 a.m. to 4 p.m., and Saturdays 10 a.m. to 2 p.m. Admission is free and everyone is welcome. To learn more about the Pick Museum of Anthropology, visit niu.edu/anthro_museum or follow us on Facebook at PickMuseumofAnthropology.